Lovage – Liebstöckel or Maggikraut in German, livèche or ache des montagnes in French – is a fragrant herb that takes me by surprise every spring. During the winter it goes doggo, dying back completely and disappearing almost without trace into the ground. Then in around March (in our climate), its serrated pale green leaves thrust upwards again, at first tentatively, then with increasing vigour until midsummer when it gets to about 1 metre high, and I have to be quite firm with it and cut it right back to provoke new growth. It has a punchy flavour, strongly reminiscent of celery, and because it’s quite assertive you need to take care when matchmaking it with food. The logical route is to serve it with neutral foods like pasta, risotto, chicken breasts, or white fish. But I admit to some memorable lovage moments twinning the herb with prawns, and also with asparagus. I was taken to task recently (in a gently humorous way) by fellow food writer Gareth Jones, who had just been judging at the World Pesto Championships in Genoa. He related to me a conversation he’d had down there with an expert in the matter of pesto alla genovese, who got extremely aggitato on the subject, insisting that proper pesto is only e-ver made with basil; anything else is sacrilege (or a sauce, or a paste, or even a horror) – hence the quotation marks around my ‘pesto’ recipe. In this one I’ve added some cream cheese instead of the more usual Parmesan or Pecorino, which helps to tame the lovage a bit. Try making some yourself, then test it out on different foods to see what it works best with. Next: Next post: Asparagus: white or green? Looks great. Will definitely make this. Thx. it’s yum – about to have it for supper with some grilled chicken breasts. D’you have it in the garden? 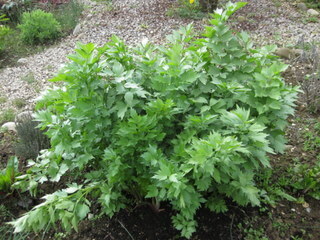 I adore lovage and just planted some in my garden – can’t wait to try this recipe! 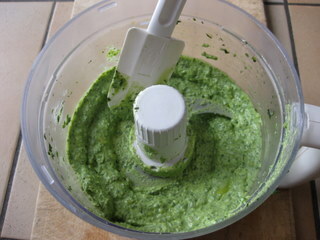 I experiment a lot with “pesto” mixes. Italians can be very puritanical when it comes to their cuisine. An ex-boyfriend of mine categorically refused to eat my spaghetti bolognese; as a true Italian would only ever eat ragú Bolognese with tagliatelle! bonkers lovage….sounds very familiar! Great ideas for using it up, though trying to keep abreast of its growth is probably a lost cause. Do you cut it back, so as to get new growth? Will definitely give the pesto (pace the Italians) with walnuts and feta a try.